Businesses orientate themselves to the marketplace in different ways. 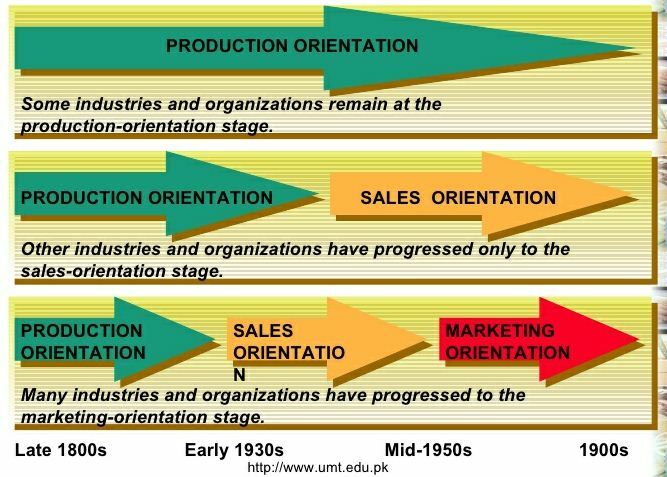 The theory of company orientation towards the marketplace categorises businesses into one of five main orientations – production, product, selling, marketing and holistic marketing. The production concept focuses on production efficiency, low cost and mass distribution. It is based on the assumption that consumers prefer products that are cheap and easy to obtain. Companies pursuing this strategy are effectively stating they can deliver their product to the end customer quicker and cheaper than their rivals. At odds with the production concept is the product concept. The founding belief of this concept is that consumers prefer higher quality products that are innovative, more effective, or more styled than their cheap and easy to obtain counterparts. The assumption of this concept is that customers are able to detect and appreciate the higher quality. The selling concept is applicable to companies that have products or services that would not sell without significant selling effort. Examples where a selling orientation strategy may be required are with unrequired goods, or where there is a large stock surplus. This concept can be risky as the hard sell can alienate their customers, and assumes that the sold product will not be returned. The marketing concept is where the company is more focused on the needs of the customer than on the selling. The first three concepts are product focused and rely on the company finding the right customer for their products. The marketing concept is different in that it is concerned with finding the right products for their customers. The holistic marketing concept is a much more wide reaching orientation and is increasingly being used in preference to the other models. Holistic marketing states that all facets of marketing matter, and is broken down into four main groups – internal marketing (employees, departments, management), integrated marketing (communication, products and services, channels), performance marketing (revenue, brand, ethics, environment, legal and community) and relationship marketing (customers, channels and partners). After marketing orientation came holistic marketing. If you are interested in the subject matter, check out the slideshare link above, and also this link which goes to a textbook chapter (probably a Kotler & Keller excerpt) covering the topic in greater detail. This entry was posted in Marketing, MBA and tagged Marketing, Orientation by Andy. Bookmark the permalink.